Thank you so much for sharing your book with me and agreeing to do a Q&A for my readers. Give us a quick summary of your book, A Warden’s Purpose, the first book in your Wardens of Issalia series? When Everson is accepted to a school of magic and science, Quinn applies for the sister school, a military academy in the same valley. During their training, they both begin to uncover secrets – secrets that leads to murder. The story actually opens with the kidnapping of both teens, each held for interrogation in a separate cell with the threat of killing the other as leverage against them. Neither knows why they have been captured, but as they relay their stories, the reader discovers that there is far more occurring within the two academies than one might assume. This is not your first book set in the world of Issalia. What about this settings keeps pulling you back to tell more stories? While writing the first Issalia trilogy, I had to develop a deep history, unique cultures, motivated characters, and political agendas that brought the world to life. By doing so, I had also created the bones for another book, one that took place 400 years before the first series. So, I wrote a prequel called Rogue Legacy. By the time the Runes of Issalia series ends, the world of Issalia has changed dramatically. In that change, I found more stories waiting to be told with new characters joining the old. The world moves forward, but with conflicting sets of ideals with magic at the core of the struggle. Within that conflict is where I based the core of the second series, Wardens of Issalia. Your two main characters are both diverse and memorable, Everson as a smart but disabled character, and Quinn as a girl who subverts gender roles. How do you create such unique characters? Similar to the real world, character’s motivations are largely defined by their nature and how they were influenced as children. In addition, a character who faces personal challenges is a more interesting character to the reader. With my first series, the main character was a member of the lowest caste in society – treated as an outcast. In the Wardens series, my first character I defined was a teen who was intelligent but unable to walk. Everson’s disability creates an internal need for him to feel useful. In that drive, he continuously invents things that change his world. Quinn’s motivation to stand up for others spun out from growing up with Everson. Living with a shy, physically challenged brother, molds her into a fierce, determined teen. She is not the best at anything, but she will do anything to become better or to win. That relentless nature creates a compelling character, particularly in books two, three, and four of the series. This is one of many novels you’ve self published. Many of our readers are trying to decide which publishing option is best for them. Why did you chose self publishing and what have the benefits been for you? My Runes of Issalia series was originally published by a small publishing house called Black Rose Writing. At the time, I knew nothing about the publishing industry. I just wanted to write books so others could read them. Two years later, I had learned a great deal about publishing and marketing books, so I reclaimed my rights and began doing it myself. Honestly, it’s a much better fit for me, and I actually enjoy many aspects of book marketing. Every author must decide what publishing path is best for him or her. Would I consider traditional publishing? Yes, with the right publisher and the opportunity to boost my career and gets my books into more people’s hands. I began writing A Warden’s Purpose in late 2017 and published it in May, 2018. It currently takes me about six months for the writing, revisioning, editing, proofreading, beta reading, and release processes to complete, with three-month gaps between each release. In contrast, my first novel took over eighteen months from beginning to publish date. The more you do something, the better you become at it while simultaneously improving the process. That has greatly sped up my writing, while also increasing the quality of the finished book. Time. It takes so much time and attention to write, revision, edit, publish, and promote a novel. Doing so while working a full time job requires additional focus and time management. Soon, I hope to have my author career supporting me so I can quit the day job and focus on writing. I have been reading fantasy novels since I was in grade school, and each book has contributed to my inspiration. I also have developed relationships with many fellow fantasy authors, and we support each other in addition to inspiring one another with our books and success. I actually prefer not to name anyone specific. I would be ashamed of leaving anyone out. There are so many talented writers in my genre. Teenaged characters have a limited imprint on their lives and are still being molded into the adults they will become. This allows for a great deal of character growth and change, which many readers find interesting. In addition, young adult characters tend to be less pessimistic because the world has yet to crush their will. Within this optimism is hope. Hope is something we all desire, for it opens the possibility of things getting better. Within hope, we find love, achieve success…chase our dreams. Who wouldn’t want that? I actually have characters based on real-life people in all my books. This includes characters based on my son and my daughter. In A Warden’s Purpose, Quinn’s rival at the military academy – a mean-spirited bully of a girl – is based on someone who bullied my daughter in real life. If you read the book and see what happens to the girl…let’s just call that karma. The next book in the Wardens of Issalia series just came out. Can you give us a hint of what we can look forward to in Everson and Quinn’s adventures? The Arcane Ward, book 2 in the series, just released on September 6th. Everson and Quinn both return and are joined by some new characters, all as members of a secret organization called ICON. They are training to be secret agents called Wardens. As readers discover at the end of A Warden’s Purpose, a new threat has risen – an enemy who wishes to conquer Issalia and vanquish Chaos magic forever. The Wardens lead the fight against this enemy. Everson is a gadgeteer, combining magic and science to create gadgets, weapons, and machines used in the fight against tyranny. Quinn trains as an espion - part spy, part thief, part assassin. In the second half of the book, she leaves on her first mission and finds herself alone in the heart of enemy lands. The internet and social media. I find myself interacting with readers on Facebook and responding to reader emails when I should be writing. However, I truly enjoy reader feedback and talking about my books, so it’s not something I wish to give up. I just need to manage my time. Write. The more you do it, the better you get. If you write something, share it. A story needs to be told to others to truly be a story. Don’t fear rejection. Every author receives rejection. It’s a rite of passage. If you think it’s good, have it edited and then pursue publishing. You will need to decide which publishing route works best for you. Regardless, networking with other authors in your genre is a great way to learn more about the industry. Wow. That’s difficult because there are so many great books. My favorite series is Wheel of Time by Robert Jordan. However, it is full-blown epic fantasy with many characters, an array of plot threads, and massive books, so it’s a significant commitment. 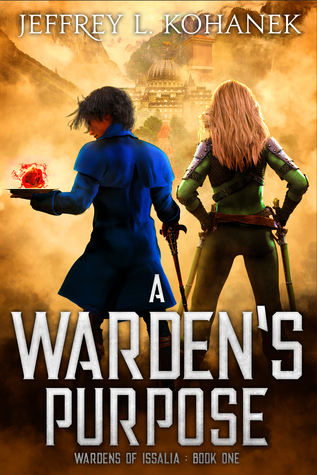 You can purchase A Warden’s Purpose and Jeffrey L. Kohanek’s other novels via his website!